West Palm Beach, FL ‐ The South Florida Water Management District (SFWMD) has been working around the clock to lower water levels in the water conservation areas to create capacity for sending additional Lake Okeechobee water south, all in an effort to alleviate South Florida's high water emergency. SFWMD Hydrology and Hydraulics Bureau Chief Akin Owosina gave an update on the District's operations through the agency's weekly video series, which is dedicated to informing the public on current water conditions and the agency's actions amid the high water emergency. The video update can be seen by clicking HERE or visiting the District's website dedicated to the emergency situation at www.sfwmd.gov/managinghighwater. 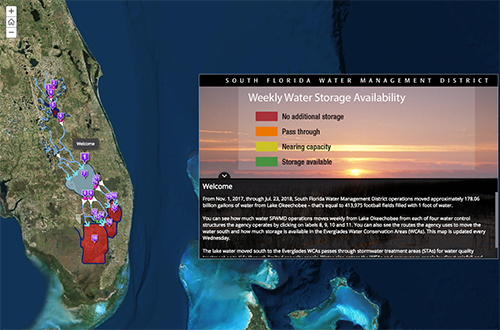 The video update shows the public how to use SFWMD's "Storage Capacity and Moving Water North and South of Lake Okeechobee" map and its "System Constraints" map to stay apprised of the latest water conditions. Both maps can be found through SFWMD's Managing High Water website. The Storage Capacity map shows the public how much water has been moved through specific structures in the flood control system in the past week and the current water levels in the conservation areas and Kissimmee Upper Chain of Lakes. The Constraints map shows how water moves from north to south in the flood control system and depicts weekly conditions and information on the structures controlling the flow of water. SFWMD uses a detailed set of criteria or "constraints" based on public safety and sound science to determine whether each structure, including Flow Equalization Basins, Stormwater Treatment Areas, pump stations and canals, can store more water or move more water south. That status is translated into a simple "traffic light" for each structure on the map with green lights meaning the structure is "unconstrained" and can move more water and red lights meaning it is constrained and cannot. Several key structures on the map are currently "unconstrained" and moving as much water south as possible. Akin Owosina, SFWMD's Chief of the Hydrology and Hydraulics Bureau, provides the July 25 update on operations to move water across South Florida.